Modani, a high fashion furniture store located on Westheimer, hosted a wine and dine event that combined interior design and fashion. There was a video of a runway fashion show, opportunities to check out their interior designs, information about the 2015 spring trends, giveaways, and plenty of food and drink. It was an awesome networking opportunity to bring together the fashion world and the interior design world. Modani furniture store represents sleek modern design. Ongoin video of a fashion show. Delicate masks were given to attendees to help set the mood. Models on the Red Carpet for photo opps. 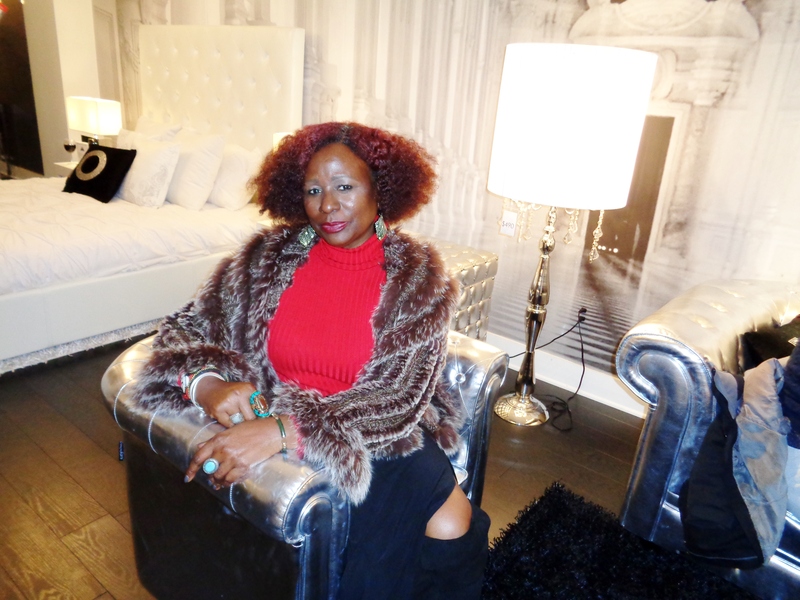 Shasie/Live Life in Style blogger represented fashion with a handout of the 2015 Spring Trends. Interior design with a style all its own. Cool photographs help bring an edge to a room. Fur sweater, long skirt, turtleneck and thigh-high suede boots perfect for a cold February night. It looks like you had a really great time! Those masks are so cute. I’m digging that silver, leather couch. I hope to see you soon! It was fun! I hope to see you soon and hope everything is going well.